It wasn't pretty. Things were tangled reef lines weren't in and needs to be strung but it was good to be out on the lake. Here are a few pictures from the family hiding out in the tea shop. So I called up Tower Marine last Saturday.. Um guys I can get to my boat... I'd like to this afternoon. After a few calls back from the office, they figured out a way to get me out there. 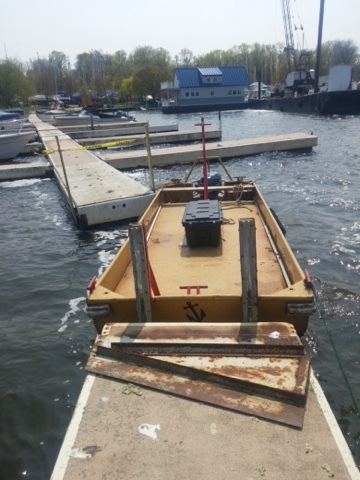 I stopped by and Bill was able to move the tow barge between the docks for me! Tower Marine rocks! Thanks R.J. and Bill. They even gave me the option to move to another dock for a while if I wanted to, but the breeze was blowing pretty hard. I decided to just check and make sure the scuppers were draining and the boat was not filling with water. Then I got the main main sail rigged up. A look back and the temporary pier set up. Riding out the surf at the dock. This made rigging the main a lot more interesting.